The Vlooyberg tower in Tielt-Winge – a symbol of the area’s magic realism, according to the town’s mayor – has been unveiled following a project to repair damage caused by vandals in the summer. “Just as this structure is both a tower and a staircase, nothing in the Hageland area is as it appears,” Rudi Beeken said at the unveiling of the renovated landmark. 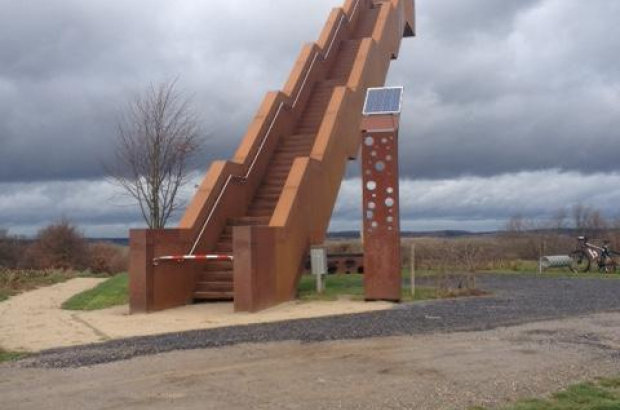 The 11m high, 20m long staircase was installed in 2013 in Tielt-Winge, near Leuven, and is well-known among the TV viewing public in Flanders for its appearance in the series Callboys. It sits on one of the highest points in the area and on clear days offers a stunning view of the surrounding landscape, from Vilvoorde in the west to Hasselt in the east. In July, five people were arrested on suspicion of causing damage to the tower, which caused it to close to the public for several months. The cost of the repairs, totalling approximately €100,000, will be recovered from those found responsible. The name of this structure should be: "The Stairway to Heaven."